More than half of American families with teenagers use filters to limit access to potentially harmful content online. But both teens and parents believe that teens do things on the internet that their parents would not approve of. As a federal court case looms about how far the government can go to protect children from harmful and objectionable online content, growing numbers of families are using internet filters to limit teens’ access to potentially harmful content. The federal Child Online Protection Act (COPA) was passed in 1998. It required Web sites containing “material harmful to minors” to use some kind of age verification system − such as asking for credit card information − to ensure that site visitors were age 18 or older. The American Civil Liberties Union and other civil rights groups brought suit against the U.S. Government, arguing that COPA is an unconstitutional infringement on the free speech and privacy rights of adults. The case bounced through the court system until last June, when the Supreme Court ruled that the law’s constitutionality should be weighed in a full trial in the federal district in Philadelphia and that the ban on enforcement should continue. It is likely that the case will begin later this year. One of the main issues in the case centers on internet filters – programs such as Net Nanny and CyberPatrol that people use to block access to certain Web sites and screen content. How often are such filters used? And how effective are they in blocking access to material deemed objectionable or harmful to children? A survey by the Pew Internet & American Life Project in November 2004 finds that the use of filters has grown significantly in internet-using households with minor teenagers (aged 12-17). The survey found that 87% of teenagers in that age bracket use the internet – about 21 million youth between the ages of 12 and 17. Of those teen internet users, 87% (a little less than 19 million) have internet access at home, while the remainder have access at such places as schools, community centers, churches, friends’ homes, or cyber cafes. More than half (54%) of internet-connected families with teens now use filters, compared to 41% in December 2000. Given the overall growth in the internet-using population of teenagers, this means that the use of filters in families with teens has grown 65% in four years, from around 7 million users at the end of 2000, to close to 12 million today. The filters tend to be used by parents who themselves use the internet most frequently and by parents of middle-school-age teens. Parents who don’t use the internet themselves but who have online children are significantly less likely than internet users to use filters. In addition to employing filters, parents are trying other methods to stay abreast of their children’s online activities. Many families are heeding the message from safety advocates about placing the family’s internet-connected computer or computers in public places within the home. And most parents say they have established rules about their children’s computer use. 64% of parents of online teenagers say they set rules about their children’s time online. However, there are still large gaps in perception about how much parent-child monitoring is taking place: Most teens do not believe their parents are checking up on them, while most parents say they are. …but only 33% of teens who use the internet from home say they believe their parents monitor their online activity. 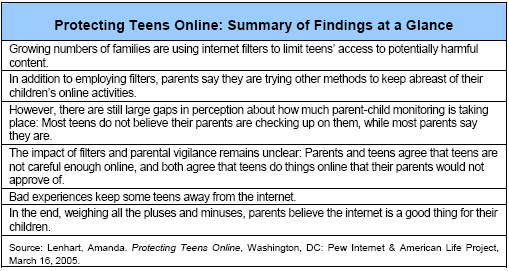 The impact of filters and parental vigilance remains unclear: Parents and teens agree that teens are not careful enough online, and both believe that teens do things online that their parents would not approve of. There is striking consensus among parents and their teens that the teenage population is not as careful as it should be online and that teens do things online their parents don’t know about. 81% of parents of online teens say that teens aren’t careful enough when giving out information about themselves online. 79% of online teens agree that teens aren’t careful enough when sharing personal information online. Bad experiences online keep some teens away from the internet. Some 13% of youth between the ages of 12 and 17 – about 3 million teens – do not use the internet. Nearly half (47%) of these non-users say they used the internet at one point or another, but then dropped off. About one in ten of all non-online teens report being offline because they had bad experiences, they face parental restrictions, or because they do not feel safe. In the end, weighing all the pluses and minuses, parents believe the internet is a good thing for their children. Despite concerns about what teens may encounter online, the vast majority of parents believe that use of the internet is beneficial to their children. 67% of parents of online teens believe that overall the internet is a good thing for their child, up from 55% in December 2000 — an increase of 53%. Only 5% of all parents think the internet is a bad thing for their son or daughter.